The long-sought addition of bicycle and pedestrian access across the length of the San Francisco Bay Bridge is one step closer to fruition. Last night, engineers presented the first design proposals for a pathway for bicyclists, pedestrians and maintenance crews to the west span, but they say the funding and technical challenges that lie ahead mean the project is still in its infancy. For more than 15 years, bicycle advocates in San Francisco and the East Bay have pushed for a west span path to connect bike commuters to the east span path expected to open between Oakland to Yerba Buena Island by 2014. “We’re very encouraged that Caltrans and the Metropolitan Transportation Commission (MTC) have come up with a design that works for the west span and the touchdown on either end,” said Dave Campbell, the program director for the East Bay Bicycle Coalition. The project would still take up to ten years to plan and construct once the estimated $500 to $550 million in funding is secured, said John Goodwin, spokesperson for the MTC, which manages regional transportation funding. Last night’s presentation of the project study report, funded by toll revenue, was just one step in developing the project initiation document, expected to be completed next summer, which will allow agencies to begin the funding search. After that, roughly five years of planning and five years of construction lie ahead. The study report “shows that the project is possible, but not that it’s affordable,” said Goodwin. Despite the lengthy project timeline, advocates praised MTC Executive Director Steve Heminger for helping to push reluctant engineers and staff to take on the daunting design and funding challenges. 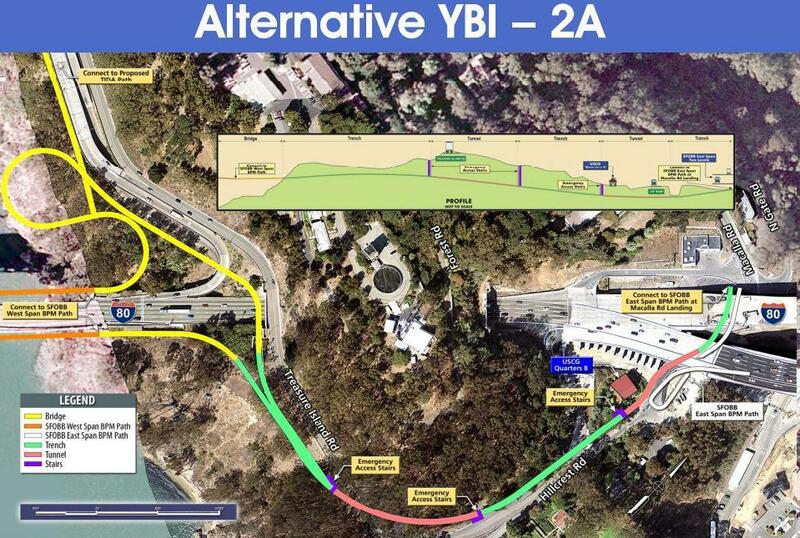 Engineers from Caltrans and the Bay Area Toll Authority last night presented a number of possible ways [PDF] to connect the path to downtown San Francisco and the bridge’s east span across Yerba Buena Island. The impact of the additional weight would also have to be mitigated, possibly by counter-weights and shortening the suspension cables, they said. In downtown San Francisco, the west end of the path would have to navigate around the existing off-ramp as well as buildings and other planned developments, but engineers presented several possible configurations. The ramp could land bike riders and pedestrians in parks planned for the areas near the highway offramp, or on the short and narrow Lansing Street. One proposal would even connect to the roof of the planned Transbay Terminal, where stairs and elevators would provide the only way down. In any case, ADA requirements would mean the path would have to avoid including steep slopes and narrow passages. On Yerba Buena, planners must also determine the best way to connect the east and west spans of the bridges by navigating the island’s terrain. 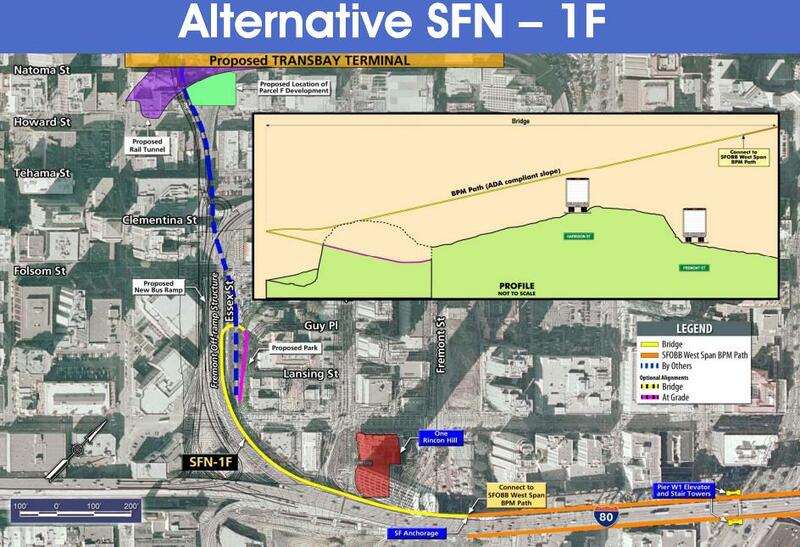 Nine alternatives had already been considered and put aside, including a path suspended through the bridge tunnel above motor traffic, due to reasons including the lack of right-of-way, poor user experience, and interference with Coast Guard operations. Advocates and officials said they plan to begin searching for funding after the project initiation document is completed and a preferred alternative is chosen next summer. 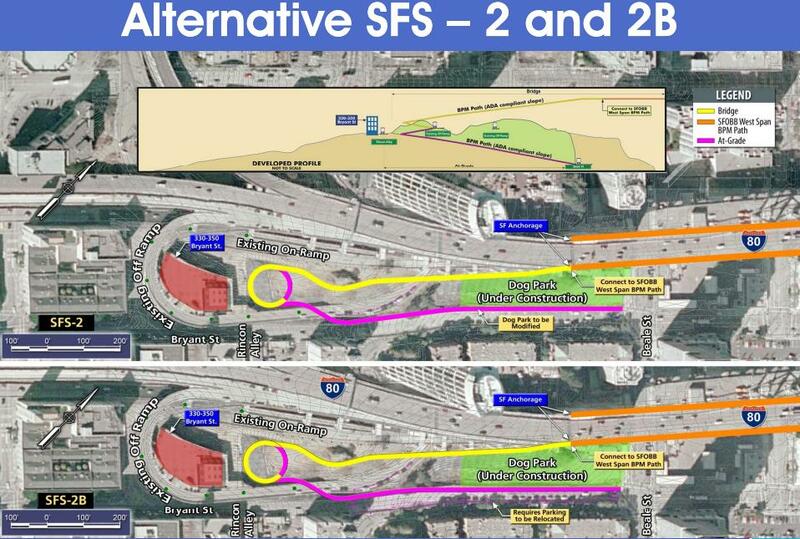 One proposal for a downtown off-ramp. Another proposal includes two variations that would land the ramp adjacent to a planned dog park. One proposal for the connection on Yerba Buena Island. Again, need to frame this as a maintenance path to keep the bridge open to cars. The media will buy in then, probably even get congressional funding. I would gladly help provide funding! This would be amazing, but as a cyclist, if I had $500 million to spend on Bay Area bike improvements, would I spend it all on this one project? Not so sure. But that’s not how funding works, so that might not be the right question. Why not just paint bike lanes on the existing bridge surface? No need for an fancy new structure. You could put 2-way bike lanes in the space of one existing traffic lane. I am all for more bike infrastructure but personally I think this is a terrible, yes a path would be nice but $500 million?!?!?!? This is not a bikeable distance for anyone but the most diehard commuters. Ride BART or a Transbay bus and then bike within SF or the East Bay. There are many better places to spend this huge amount of money on bike infrastructure that will benefit thousands more. wow that is a lot of money… i am convinced that it does not need to cost that incredible amount but it would be a really great bike link, especially with a direct connection to the transbay terminal, assuming a reasonable way to get downstairs were provided. 7 miles. We are a pantywaist nation when a 7 mile bike ride is diehard. A 7 mile RUN should not be considered diehard. Pretty cool, but that top photo looks a little dangerous. While I am also weary of the high price tag, remember infrastructure construction and maintenance is not equal for bicycles and cars. Car infrastructure is far more costly to build and the weight of cars traveling on our roads produces much more damage than a bicycle ever could. 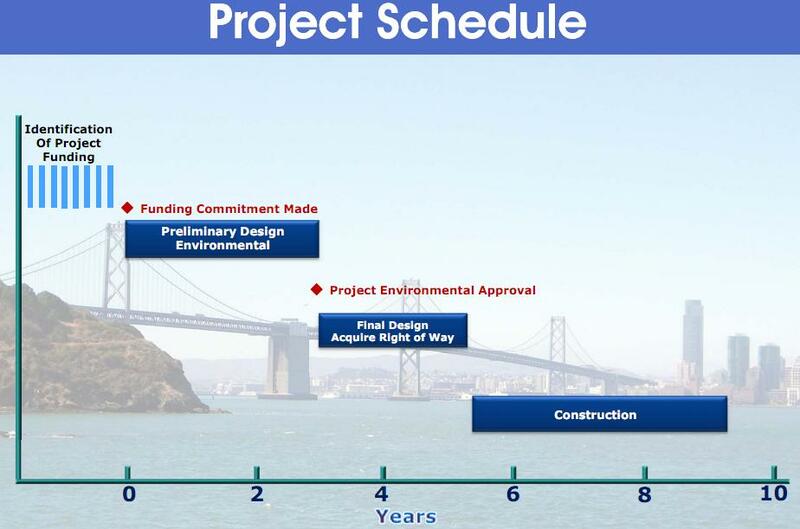 Let’s also understand the cost of this project (~$500 million) in the context of the Eastern Span rebuild (~$6 billion, 300 million). A new Western Span would likely be even more expensive, even if only for auto traffic. Bottom line: bicycles require much less infrastructure, which is less costly to both construct and maintain. Of course people driving cars should be taxed more highly for choosing to move using more expensive mode of transport. How hard would it have been to Photoshop in some more accurate people on the ped/bike causeway? Those aggressive “bicyclists” with the boy and father looking on with disapproval only perpetuates stereotypes. Cyclists don’t pay anything? Good for you Chris. Don’t let the truth get in the way. The truth is that our roads are largely paid for by property taxes and sales tax. Gas tax and tolls hardly cover squat. And that is just the direct costs… we won’t get into externalities (such the health care cost born by a society who can’t be troubled to exorcise, pollutes too much and subsidizes giant oil, which only re-enforces our desire to drive). It will cost more. Not the best use of limited funds. Think how many miles of bike lanes, how many bike stations, etc. could be built for $500,000,000. For well over sixty years, most transportation funding has gone into building, improving and expanding automobile infrastructure. Isn’t it time to start playing catch-up for other modes of travel? A bicycle/pedestrian path on the western span will be very popular for locals and toursists alike. I imagine it would rival the Golden Gate Bridge in popularity. Ideally such a path should be designed so that those using it are cushioned from the noise and exhaust of passing vehicles. I have seen bike/ped paths on bridges in Vienna, Austria that are suspended beneath the bridge. The walker’s and biker’s experience using such paths is much more peaceful and enjoyable without the loud sounds and fumes of passing vehicles. Yoo hoo, Chris? Anyone home? Care to respond to the actual real world facts that “Guest” brought up? The thing is, $500m will NEVER be spent on bike lane projects anywhere else. Just plain and simple MTC protocol. I don’t know where I fall on this. I would like to have the option to bike across the bay as I use Dumbarton from time to time and it’s great, but this is a huge chunk of change. Eh, I’ll leave this for others to figure out, but I do know that money isn’t going to other bike lane projects, it’s mostly toll money so it’d go to road deck upkeep or some other bridge projects. If this starts being framed as getting maintenance crews off the main deck then it’s not a $500m bike lane, it’s a $500m “don’t block the cars” lane. And we just happen to get to bike across the bay. 1) Remember, biking 7 miles all the way across the Bay Bridge wouldn’t be the only option. Equally if not more important would be Treasure Island residents having access, via much shorter rides, to jobs and recreation in SF proper and the East Bay. And maybe new “things to do” and/or jobs would sprout on Treasure Island, and now there would be a much better way to access them. 2) $500mm paid for out of bridge tolls is not the same thing as $500mm of local bike projects paid out of the other funding pots that cities use to implement them. I’d like to see an estimate of how much bridge tolls would have to go up to fund this is a reasonable length of time. How much are we talking about? 50 cents? A dollar? 3) Creating a new visual icon for SF tourism — the view of the City as seen from the bike/ped path — is worth a whole more than $500mm. Anyone see that Absolut Vodka ad that imagined that? Unlike the GG Bridge, tourists could stay in downtown and rent a bike and ride up onto a huge bridge just minutes from their hotels. 5) Five years for construction … OK, I get that this is a complicated project. But five years for planning?! Really people??!! Are we actually serious about doing something about reducing CO2 missions and switching to multimodalism, or are those just nice soothing fairy tales that we like to tell ourselves? Caltrans’ top leadership sometimes says some nice things about multimodalism, but I don’t believe for a second that that message has filtered downward throughout the organization (with a few bright spot exceptions, to be sure). That ridiculous timeframe (maybe along with the scary rendering, as someone else pointed out) suggests to me that Caltrans has to be dragged kicking and screaming into this project. The bike/ped community needs to hold their feet to the fire and keep the pressure on. I very much doubt that the project would really cost $500,000,000. However if that’s the number we’re going to discuss, then I have an alternative proposal. Spend 1/10th of that on a fleet of mini bike ferries to shuttle between TI and The Embarcadero every five minutes. Spend another 1/10th on a sea-level path from the TI ferry terminal, around the north shore of YBI, to a large double elevator up to the east span. I wonder how the bike path would go from the East Bay touchdown to Oakland city streets. Through the Port of Oakland, I expect. I hope it will have its own right of way. The idea of bicyclists sharing roads with 18-wheelers doesn’t seem like such a good idea. They haven’t quite figured this one out yet. When the auto bridge opens, the promenade will still be unusable. Oh, that’s brilliant! Personally I think the walk/bikeway should go along the north side of the freeway and connect with the Frontage Road at Powell Street in Emeryville. That would make it very convenient to those biking from Berkeley using the Ashby bike bridge. This is a classic example of why California, the United States and the rest of the world is in a financial mess. $500 million for any bike path is expensive!!!!! Supporters of these types of projects always think that “someone else” will pay for them (e.g., the Federal government, corporations, the 1%, etc.). Its unbelievable that we ALL have haven’t figured out yet that we ALL pay for these projects directly or indirectly. There is no free lunch. We collectively need to start making rational financial decisions regarding how our tax dollars are spent. They did accurately portray the pedestrians walking 3 abreast, shuffling along in the bike path, not paying attention to anything. This is one of my peeves about new bike infrastructure: cyclists are often lumped together with pedestrians as “not-cars” so that the end result is something that mixes the two together in a way that serves neither very well and ends up only reinforcing hostilities. There’s a lot of this in NYC as well especially on the bridges (most of the bridges on the Hudson require cyclists to either mix with pedestrians or dismount entirely). Mixed use paths like this might be good if your goal is to stroll along leisurely and take in the sights but what if you’re actually trying to get someplace fast? It’s just another example of city planners not understanding that people can and will, given the right kind of infrastructure, use bikes for transportation and not just for recreation. That bridge looks dangerous! It appears the cyclists and wheelchair user are about to plummet to their deaths. Seriously though, as I transplanted New Yorker, I was shocked to find (A) cars in Golden Gate Park and (B) no bike access to the Bay Bridge. It’s high time we make the park car-free and open the bridge to cyclists, pedestrians, and, oh yeah! inline skaters. Looking forward to your upcoming Streetsfilm. About time we build up some momentum for a car-free GG Park. Then we won’t need to bicker over a cycle track on JFK. Hey, I have an idea: let’s take out a couple of car lanes and turn them into bike and pedestrian lanes. That would cost practically nothing and the drivers can have a close-up look at how much more fun biking is than driving in traffic. You’ve changed a lot in 2 years Mike. If there’s a $500 million bike connection in the world, this is it. It’s not cheap, to be sure, but the tourism and commuter value is probably worth it in the long run. Crazy idea, but perhaps there could be a toll for bicyclists to help pay for it. I stand by the way it needs to be framed to get built. Sell it as a way to not block a car lane and the money will rain down like manna from MTC heaven. Right, and I’m sure you’re far more appalled in that case by the $6 billion spent on replacing the other half of the Bay Bridge — most of which cost was due to insistence on building a “postcard bridge”.